These are breads with very little, if any, fat. Baguettes, French Bread, Rye Bread. Chewy with a crispy crust. 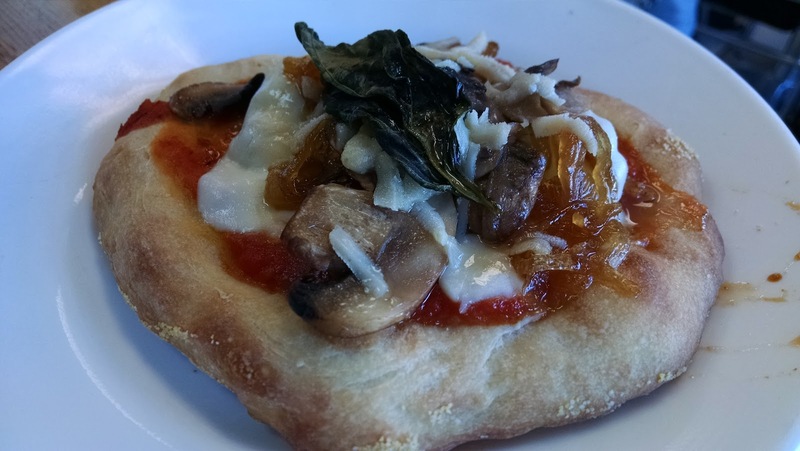 First, Chef Martha demonstrated the mixing method by making a batch of pizza dough. While that fermented we broke up into four teams and each team made a batch of baguette dough and another dough. My partner and I made a traditional French loaf. Every half an hour, we had to punch down, fold, and flip our dough until each dough had been flipped at least four times. One team made Pullman loaves which are baked in special covered pans. Another made rye bread and another, whole wheat. The pizza dough was ready first and we each got to make our own pizza crust which got prebaked enough to be browned and sturdy. Then we made individual pizzas and took a break for lunch. Sausage, caramelized onions, mushrooms, mozzarella and basil. 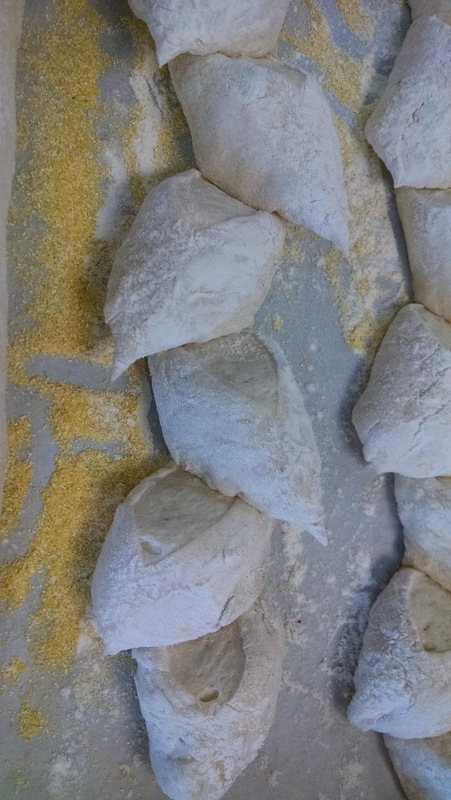 After lunch, it was time to shape the baguettes and let them proof in a couche (flour lined canvas bed). 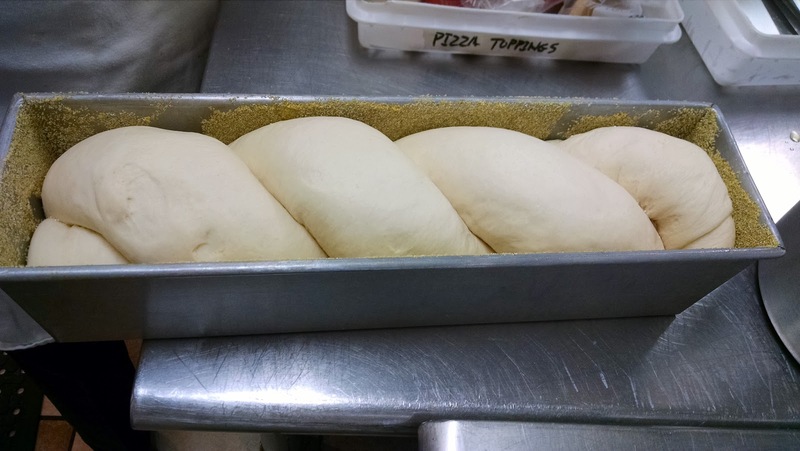 Then we shaped the other loaves. Our traditional French bread was too sticky so it was converted to a rustic ciabatta loaf. The whole wheat bread became fougasse and the rye was shaped into batards. All were proofed and baked on cornmeal. Even the Pullman loaf pan was coated in cornmeal. Some of the baguettes were converted into epis. 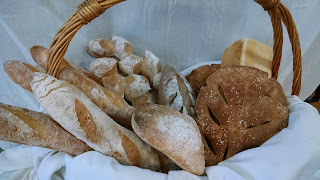 At the end, of course, all the breads were staged for their photo session and divided amongst the class. You're killing me. I've been doing a gluten-free superfood diet all weekend. It's not bad, but tomorrow: BREAD!